I was in Derry on Thursday for the Epic Awards 2013 Winners’ Reception: it was a wonderful occasion. Before the Epic Awards activities got started, Kevin, Stephen, Marilyn and I had lunch with politicians from the Northern Ireland Department for Culture, Arts and Leisure Committee, which had been holding its meeting in Derry. The Chair and one other member of the Committee then came to the evening Epic Awards reception. 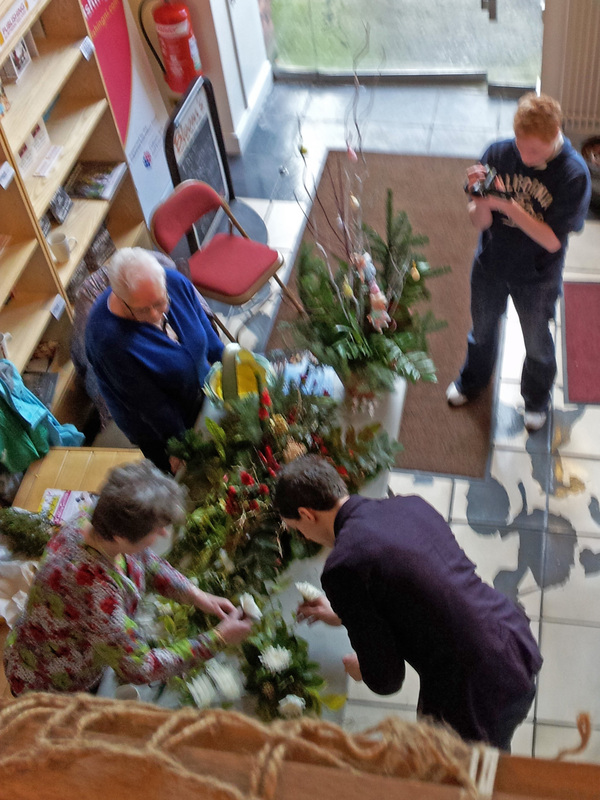 Throughout the afternoon the Verbal Arts Centre was full of local voluntary arts groups demonstrating their activities and allowing members of the public to try their hand at a variety of arts and crafts. The atmosphere was lovely and the building was packed – with a TV crew squeezing past participants to get the best shots. During the afternoon we learned that the Epic Awards Winners’ Reception had just been mentioned on BBC Radio 2. 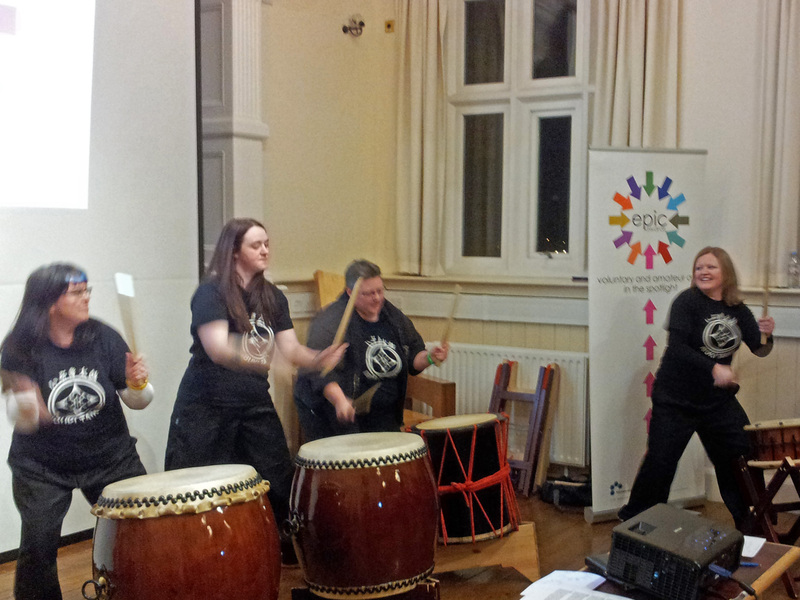 The evening reception started with performances from the City of Derry Guitar Festival and the Taiko Drumming Circle. We then commenced the presentations, with the winning groups receiving their prizes from the Mayor of Derry, a Government Minister (Jonathan Bell from the Office of the First Minister and Deputy First Minister) and Voluntary Arts Chair, Peter Stark. As in previous years, the acceptance speeches by the representatives of the four Epic Award winning groups were passionate and inspiring. A packed audience was charmed and astounded by the stories of what had been achieved by voluntary arts groups across the UK and Ireland. At the end of the evening we announced that our new Peer Award for Excellence (for which all the shortlisted groups were asked to nominate each other) had been won by the Ireland Epic Award winners, the Fermanagh St Patrick’s Day Parade. This news brought the house down – with the Fermanagh group genuinely thrilled. Theirs is an amazing story – of reinventing the idea of a St Patrick’s Day parade as a cross-community, non-sectarian carnival which last year attracted 14,000 people. Details of all the Epic Award winners (and photos of the award presentations) are at http://blog.epicawards.co.uk/2013/02/winners-receive-awards-and-accolades-at-one-epic-party/ – many congratulations to them all. And many thanks to everyone across Voluntary Arts who helped to make the 2013 Epic Awards so successful. On Monday I hosted ‘Running Your Group Weekly’. Daniel and I were joined by the volunteering consultant Rob Jackson who spoke about the lessons learned from the London 2012 Games Maker volunteer programme. You can watch the recording of Monday’s webcast at: http://www.voluntaryarts.org/running-your-group/running-your-group-weekly/.